Waikiki Beach - The one and only. Enjoy the beauty, the sun, sand and warm waters. Have some cocktails and relax. Longboarding at Waikiki. Right in front of the Duke Kahanamoku statue on the far end of Kalakaua Ave is a great place to rent long boards and short boards for cheap. Snorkeling at Hanauma Bay - This is one of Oahu's most popular snorkeling spots. It is a volcanic crater with a broken sea wall. 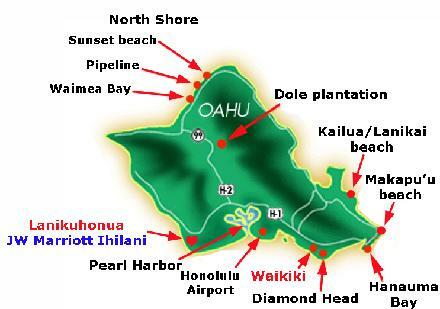 To get there by car from Waikiki take Kalanianaole Hwy to Koko Head Regional Park or take TheBus no.22 from Waikiki. Parking is difficult and the walk to the lagoon is long but worth it. Kailua (Lanikai) Beach - Voted as the best in the world. It is absolutely beautiful two miles of sandy beach and perfect for all beach activities. This is about 30-45 minutes drive from Honolulu. For directions click here. For public transportation take TheBus no. 56 or 57 into Kailua, then the no. 70 shuttle. Makapu’u Beach - 1000 foot gold sand beach cupped in the middle of the Koolau cliffs, it is Oahu’s eastern most point. The views are beautiful. Drive east on H1 past Hawaii Kai, Hanauma Bay and the Halona Blow Hole along the coast. It is right across from Sea Life Park. North Shore - Famously known for its big surf during the winter months. Go check out some of the sensational beaches such as Sunset beach, Pipeline, and Waimea Bay. It’s also a beautiful drive. Beaches, beaches, beaches - Click to see a beach directory of all beaches on Oahu. Manoa Falls Hike - This is an easy and beautiful 2-3 mile (roundtrip) hike that takes about 1.5-2.5 hours. You reach the beautiful and super romantic Manoa Falls. Diamond Head Hike - Diamond Head Road at 18th Avenue, Honolulu. This hike is beautiful. 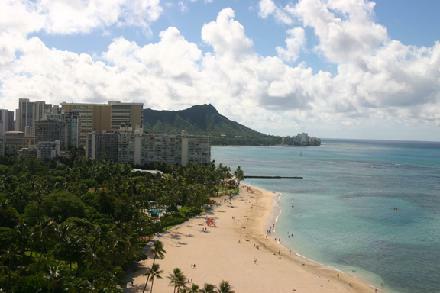 You get a bird’s eye view of Waikiki, Honolulu, and the many spectacular beaches. It is a fairly easy well worn path with some steep parts. It is about a 1.5 mile hike that takes about 1.5 hours round trip. Informational brochure for Diamond Head. USS Arizona Memorial - One Arizona Memorial Place, Pearl Harbor, Honolulu. The battleship USS Arizona was sunk on Dec. 7, 1941, taking 1,100 sailors with it. A beautiful monument was built in 1961 as a memorial. The deck of the USS Arizona lies six feet below the surface of the water at Pearl Harbor and is visible from the monument. Click on the USS Arizona Memorial link above or simply click here for directions. From Waikiki the drive is approximately 45 minutes west on H-1 past the airport. From the JW Marriott it is 20 minutes on the H1. USS Missouri Memorial – Right across from the USS Arizona Memorial in Pearl Harbor. Go visit the battleship General Douglas MacArthur announced the end of World War II in Tokyo Bay in 1945. Simply click here for directions. From Waikiki the drive is approximately 45 minutes west on H-1 past the airport. From the JW Marriott it is 20 minutes on the H1. Chinatown Hawaii - Chinatown is Hawaii's most exciting and mysterious neighborhood. The historic district is located in downtown Honolulu, and has long been a popular gathering place for locals and visitors. As a gateway to Hawaii for many immigrants, Chinatown is a colorful and eclectic blend of Southeast Asian cultures. Click here for a walking map of some of the great historic sites to visit in Chinatown. Dole Plantation - Dole Plantation is the home of the Pineapple Garden Maze, the World’s Largest Maze according to The Guinness Book of World Records 1998. Learn everything you wanted to know about pineapple as you see displays about the history of the pineapple, Jim Dole’s contributions to the pineapple industry and video presentation of pineapple processing. For directions click on Dole Plantation link above or simply click here. Bishop Museum - Hawaii's best displays on Hawaiian history and natural history, and the world’s finest collection of arts of the Pacific. Polynesian Cultural Center - Visit Hawaii's favorite visitor attraction. Visitors can enjoy 7 Pacific island villages on 42 tropical acres, Hawaii's most authentic luau, Horizons, the island's largest evening show, Hawaii's only canoe pageant, a Polynesian art and handicrafts marketplace, and an IMAX theater. Ala Moana Shopping Mall - 200 stores right across the street from the beach. Take the red, yellow, or green trolley or TheBus nos.8, 20, 42, or 58. Golf - World famous golf courses all over the island. Top two recommended courses: Pali Course – toughest on the PGA with breathtaking mountain views and waterfall hazards. The Pali course is the personal favorite of Cami’s Dad. Ko Olina – the course of the JW Marriott. Home of the LPGA Hawaiian Open. Only one course is better on Oahu (see Pali course). Check with the Hotel for tee times.